by Joseph A. Pipa, Jr. 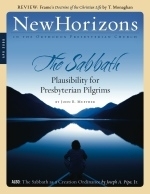 Living in an age of Sabbath indifference, we may be surprised to learn how nearly universal was the Sabbatarianism of nineteenth-century American Protestantism. The sanctity of the Lord's Day was high on the agenda of nineteenth-century evangelical social reform. From the time of the Reformation until the middle of the twentieth century, the great majority of Protestants held fairly strict views regarding the use of Sunday. With the encroachments of liberalism, the rise of dispensationalism, and the ubiquitous presence of television, Sabbatarian practice has so declined that today only a small minority of Christians in the West hold to it. Most Christians today argue that Sunday is a day of worship, but that the Christian is not obligated to observe it according to the fourth commandment. Who is correct? Does the Bible require us to observe one day in seven, or are all days equal? Is Sunday to be observed according to the fourth commandment, or are we free to spend the day as we please, so long as we worship? Those on the left say that meeting for worship on Sunday is just a custom that has no necessary relation to the fourth commandment. Those on the right say that the church must still observe Saturday. The Orthodox Presbyterian Church takes a moderate position, insisting that we must observe Sunday. We defend both the moral necessity of observance (against the left) and the change of day (against the right).